Heat the butter in an 8-inch skillet over medium heat. Add the onion and cook for 2 minutes, stirring occasionally. Stir in the parsley, garlic and paprika. Sprinkle in the flour and stir well. Whisk in the broth. Reduce the heat to low. Cook and stir for 1 minute or until the mixture is thickened. Stir in the chicken and olives and cook for 3 minutes or until the chicken is hot. Remove the skillet from the heat. Let cool for 10 minutes. Season to taste. Heat the oven to 400°F. Grease or line a baking sheet with parchment paper. Cut each pastry sheet into 9 squares, making 18 in all. Roll out on a lightly floured surface or pick up and stretch each square to 4x4-inches in size. Place about 1 tablespoon chicken mixture in the center of each square. Fold the pastry over the filling to make a triangle and pinch the edges together to seal. Place the empanadas onto the baking sheet. Crimp the edges of the empanadas with a fork. Bake for 20 minutes or until the empanadas are golden brown. 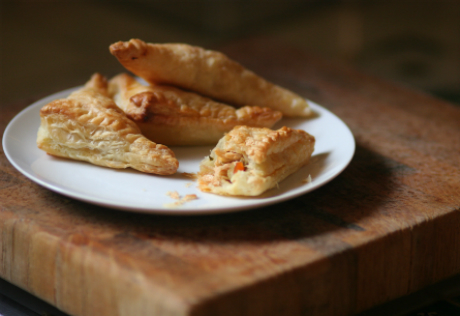 Ingredient Note: Puff pastry makes any meal elegant and special! In order to work with puff pastry, if must be chilled but not frozen. Room temperature puff pastry is difficult to work with, and frozen puff pastry breaks in half when you try to fold it. Once you are familiar with the exact right temperature for working with puff pastry, you will be thinking of how many ways you can incorporate it into your meal planning! Ingredient Note: Refrigerate the leftover chicken broth for use in soups, stews or rice dishes.